You need new shingles. Do you have to remove the old ones, or can you put new shingles on top as a second layer? That depends largely on the current condition of the roof and your own skills in DIY projects. If you live in a simple, ranch-style home, the reroofing project is relatively easy as long as the existing roof is in good shape. Before you start hefting shingles to the roof, consider whether or not the project is worth doing yourself and if you have the skills to handle it. A typical home owner can save 50-55 percent of the cost of a professionally contracted roofing job by doing the work himself. However, the project will likely take much longer than it wood if you hired a pro roofing company. 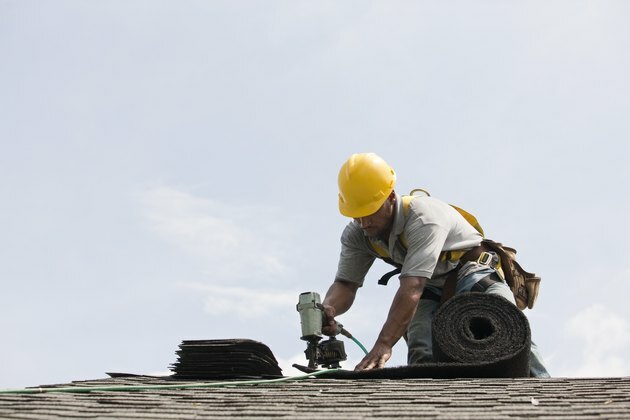 Consider the pitch of the roof, the temperature and your level of physical fitness before attempting any roofing or exterior remodeling project. Steep roofs are particularly dangerous when it comes to adding roof layers or handling any roofing maintenance. Before you add shingles over shingles, you need to look at the existing roof to make sure it's in good shape. Examine the edge of the roof to make sure there's only one layer of shingles currently installed. In most areas, building codes allow for up to two layers of shingles installed on a roof. Any more than two layers of shingles can be too much for the roof to handle even if the local building codes don't outlaw it. If two layers already exist, you'll need to remove the old layers before installing a new layer of shingles. Physically inspect the entire roof to determine the soundness of the wood roof decking, which is under the shingles. Identify any areas in which the roof deck is damaged or deteriorating. Any sagging or excessively spongy areas can be evidence of rotting wood under the shingles. That damage needs to be repaired instead of just being covered up with more shingles. Remove shingles from any area where you notice deterioration or damage to the roof decking. Replace the damaged roof deck with 3/4-inch OSB board. Add a layer of shingles over the newly repaired area before you install your second layer of shingles. This step is important because it brings the underlying surface back to a level height, consistent with the rest of the roof plane. That helps your final layer of shingles look flat with a proper installation. With the roof repairs handled, you're ready to starting installing shingles over shingles. Cover the landscaping, flowers and shrubs under the work area with the blue poly tarp to protect those areas from falling shingles. Cut the tabs off a number of shingles. The resulting shingle will be 1/2 the height and the same length as an uncut shingle. This is the starter row shingle. Cut enough shingles to cover the length of the lower edge of all roof planes. Apply the starter shingle so that the top edge butts up against the bottom edge of the 2nd row of shingles, and the bottom edge is flush with the edge of the roof. Apply this starter shingle along the entire length of the lowest edge of all roof planes. The goal is to create a level surface for the first course of new shingles. Now you're ready to cover the rest of the roof with shingles. Follow the installation instructions provided by the manufacturer. Begin at the lowest edge of the roof plane, and install the shingles with galvanized or zinc-coated nails. Select a length of roofing nails that penetrates completely through the new layer of shingles, existing layer and the wood roof deck. Apply the shingles to all roof planes, ending a row of shingles at the top of the plane, which is the ridge or peak, and cut to follow the profile of any outside corners. When shingles laying on two roof planes approach each other in a valley, weave the layers of shingles across the valley to create an integrated, unbroken water barrier across the valley. Apply a liberal amount of plastic roof cement at the base of any fixtures, plumbing pipes or roof vents which break the plane of the roof surface. The final step of the reroofing job is to install the cap shingles. Cut a number of shingles into thirds, separating each shingle tab into an individual roof cap shingle. Cut the upper portion of the shingle at approximately a 15 degree angle. These roof caps will lay atop each other, and the angled area will be completely covered by the finished portion of the shingle. Apply the roof cap to any outside corner along the ridge beginning at the bottom of the ridge, and overlapping them toward the top edge of the ridge. Apply the final cap so that it completely overlaps the upper corner of the roof planes. Apply roof cap shingles along the peak of the roof, overlapping the shingles on each side of the peak. Apply one nail in each side of each roof cap shingle. Cut the final roof cap shingle in half, trimming off the unfinished side of the shingle. Apply the final shingle with two nails through the finished surface. Apply a small amount of plastic roof cement over the nail head to seal the surface. Your new shingle installation protects your roof and saves you time by eliminating the shingle removal step. As long as you handle any repairs first and stick to no more than two total layers of shingles, reroofing over old shingles is an effective way to spruce up your home.